Ramuh's granddaughter Ramiu also featured. The latest issue of Weekly Jump confirms the appearance of Rikku from Final Fantasy X in the upcoming World of Final Fantasy. Voiced by Marika Matsumoto, Rikku is a girl with a freewheeling and bright personality who has been working as a treasure hunter in the sea. 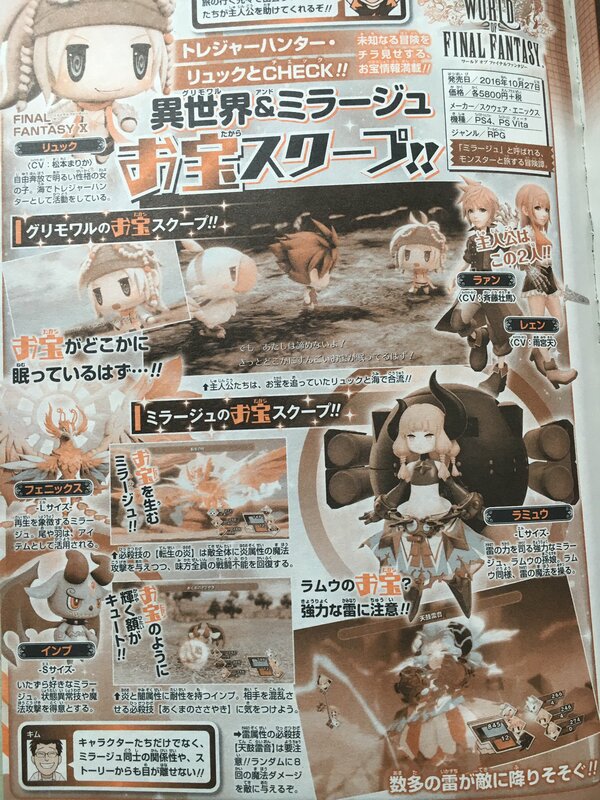 The magazine also has a spotlight on three Mirages (monsters), including the L-size Phoenix, the S-size Imp, and the L-size Ramiu. The latter is the the granddaughter of Ramuh, a mainstay Final Fantasy summon. She is a powerful Mirage who, just like Ramuh, can use thunder magic. World of Final Fantasy is due out for PlayStation 4 and PS Vita on October 25 in North America, October 27 in Japan, and October 28 in Europe.